Many parents have heard of hand foot and mouth disease (HFMD) but few know what it is. Usually seen in children and rarely in adults, hand foot and mouth disease is a viral infection, mostly caused by coxsackievirus A. Most adults are immune to hand foot and mouth disease, as they would have been exposed to the virus as children. The virus is highly contagious and the incubation period (time between catching the virus and showing symptoms) is about 3-5 days. Avoiding those who have symptoms of HFMD reduces the risk of catching it but bear in mind contagion is possible before symptoms show. Small blisters then appear on the inside of the mouth, palms of the hands, fingers, soles of the feet and the nappy area. Viral meningitis is infection and inflammation of the membranes and fluid surrounding the brain and spinal cord. This causes fever, headache, stiff neck, and back pain, and usually means a stay in hospital. Encephalitis is a very severe and potentially life-threatening disease involving brain inflammation. Cases of this are extremely rare. See your doctor immediately if your child complains of a sore, stiff neck, or a severe headache, or if the fever is prolonged. Keep up fluids to avoid dehydration if temperature is high. If mouth blisters are sore, your child might prefer ice blocks. You can buy oral hydration blocks, or freeze coconut water into icy poles. Eating might be painful, so soft foods are best. Avoid foods that are high in acid or salt, which might sting your child’s mouth. You can use paracetamol for high temperatures, or if your child is very uncomfortable. It takes about 3-5 days for a person who is infected with HFMD to develop symptoms. 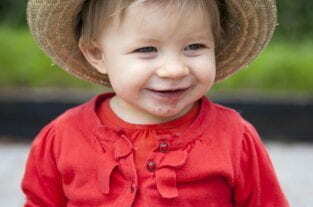 Most cases of HFMD are passed on by airborne droplets from sneezing or coughing. It can also be transmitted by touching the fluid in the blisters, as well as in faeces. HFMD is very common in childcare centres and schools, where children might not wash their hands properly after toileting or sneezing. Avoid piercing blisters deliberately as the fluid is infectious. Children who have HFMD shouldn’t go to school, childcare or kindergarten until their blisters have dried up. Is Hand Foot And Mouth Disease Dangerous During Pregnancy? HFMD is relatively rare in adults because most will have already been exposed to the virus as children. If HFMD is contracted during pregnancy, there’s normally no risk to the unborn baby, as complications are rare. If you develop HFMD during the first trimester, there is a slightly increased risk of miscarriage due to high temperature. Contracting HFMD just before giving birth increases the chance you will pass the virus to your baby. Most newborns will only have mild symptoms; however, if there are blisters present in the mouth, this can make early breastfeeding a challenge. Seek advice from a lactation consultant if your newborn baby has HFMD and is having problems feeding. In very rare situations, complications of HFMD can affect the baby’s organs, which can be severe. Never hesitate to seek the advice of your doctor or health care provider for diagnosis and treatment if you or your child has a rash, headache, or signs of dehydration, or if you have any concerns at all. Recommended Reading: Fever Phobia – What Is The Best Way To Treat A Fever?